1. Heat the oil in a frying pan over a medium to high heat. Add the meatballs and fry for 10 minutes, turning occasionally. 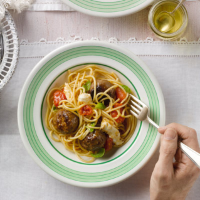 Using a fork, squash the cherry tomatoes slightly in a bowl and add to the meatballs along with the garlic. Cook for 2 minutes, then remove from the heat. 2. Meanwhile, cook the spaghetti following packet instructions until al dente. Drain, then stir through the meatballs and tomatoes. Stir in the basil and mozzarella, and serve immediately with a drizzle of olive oil, if liked.